Michael Flynn, ex-national security adviser to President Donald Trump, did no wrong by calling Russian Ambassador Sergey Kislyak, but didn’t inform Vice President Mike Pence properly about the call. That’s why Trump asked for his resignation, the President said during a Feb. 16 press conference. Flynn called Kislyak on Dec. 29, the day President Barack Obama announced sanctions against Russia for allegedly orchestrating the hacking of Democratic National Conference emails and the release of the emails as an attempt to influence the U.S. presidential election. The sanctions were allegedly discussed during the call, according to unnamed government officials cited by The New York Times. Flynn said the conversation wasn’t about the sanctions per se, but only broached the fact that Obama expelled 35 Russian diplomats as part of the sanctions. That aligns with what an anonymous source told The New York Times. “He never explicitly promised sanctions relief, one former official said, but he appeared to leave the impression that it would be possible,” the paper wrote. The problem “was really what happened after” the call, Trump said during the press conference. Because of “fast pace of events,” Flynn gave Pence “incomplete information” about the call, Flynn stated in his resignation letter. That led Pence to state during multiple interviews that Flynn didn’t discuss the sanctions at all. Trump’s Press Secretary Sean Spicer and Flynn himself repeated the claim. “He didn’t tell our Vice President properly and then he said he didn’t remember, either way it wasn’t very satisfactory to me,” Trump said. 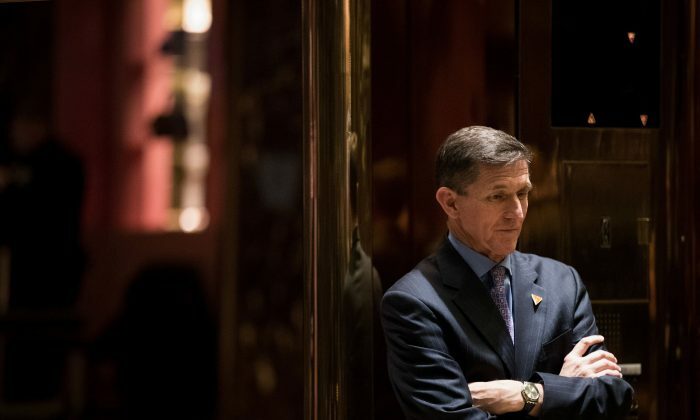 On Feb. 13, Flynn resigned. “I have sincerely apologized to the President and the Vice President, and they have accepted my apology,” he wrote.